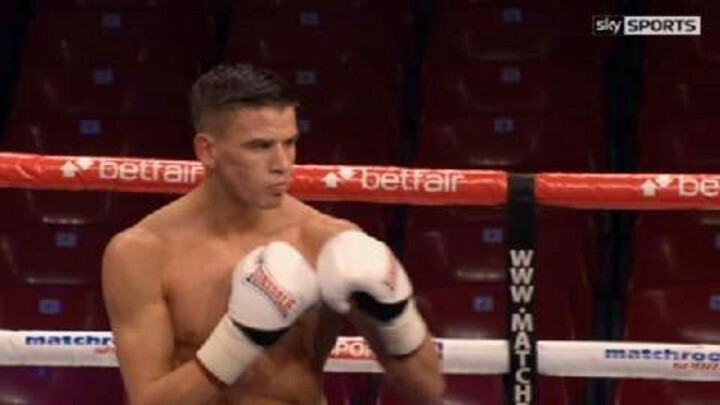 Martin J Ward TKO5 Maxi Hughes – Martin J Ward, 11-0-2 (6KO’s), left no room for doubt second time around as he convincingly halted Maxi Hughes, 13-2-2 (2KO’s), on his stool at the closure of the 5th round of their super-featherweight rematch. It’s been a long wait for Tony Sims’s charge; he felt he had done enough in the first meeting in December – in which he was controversially down twice – to earn more than the majority draw awarded. There could be no debate this time around as Ward displayed his superior speed and boxing ability from the outset. After a nip and tuck 1st round the Essex-based traveller took control, walking his opponent onto a pair of beautiful right hands as he began to find his rhythm in the 2nd. Ward claimed the centre of the ring in the 3rd and 4th, proceeding to utilise his sharp and varied footwork to force Hughes onto the back foot and land his sharp combinations from range. By the 5th round Hughes’s nose was bust and gushing with blood. Visibly struggling with his breathing, he went for broke in an attempt to land that one big left hand from the southpaw stance. Ward was having none of it, now in full flow, in and out of range punishing the brave Yorkshireman with great regularity. At the close of the round the doctor waved the fight off with Hughes in no position to continue, no complaints could be had from anyone involved. Ward was back to the prospect that has had so many people excited and moves onto to bigger tests ahead. You get the feeling he has a lot more to show us and certainly has the tools to make fights a lot easier than he does at present. Tyrone Nurse improved his record to 31-2 (6KO’s) with a hard fought victory in a fantastic light-welterweight domestic scrap with late replacement Liam Taylor, 11-1 (4KO’s), who stepped in when original opponent Chris Jenkins fell ill only days before the weigh-in. Always exciting Nurse was keen to engage from the outset and was met in the centre of the ring by his opponent from Middleton, both exchanging aggressively in a 1st round that was difficult to award either way. Taylor was clearly pumped up, but it was Nurse who settled the quicker landing the cleaner punches behind his flicking left jab, which was punctuated by a lovely right cross that rocked the head of the game Taylor. Nurse looks classy when letting the punches go, however, he is never in a dull fight and that has to be attributed to his footwork. Happy to remain in range and dip, swerve and parry his opponents’ work, he is susceptible to a struggle against a committed fighter who will put the punches together – as displayed in his previous defeat to Dave Ryan. So it proved through rounds 4-6 as Taylor put on a big effort, exchanging at close quarters and finding Nurse regular with a decent jab and whipped hooks both upstairs and down. Any worry of a replay of the Ryan defeat was extinguished early in the 7th, when Nurse dropped Taylor with a sickening right hook to the body that had the 24-year old holding on for the remainder of the round. Taylor would not be deterred and put forth a tremendous effort through the 8th, 9th and 10th rounds, but it was Nurse who was the controlled fighter, both offensively and defensively doing enough to take all three rounds and close out a superbly entertaining fight. The judges all scored 97-93, 97-92, 98-92 all in favour of Tyrone Nurse. British light-heavyweight champion Bob Ajisafe, 15-2 (6KO’s), dispatched the hopelessly overmatched George Kandelaki, 14-13-1 (4KO’s), a Georgian late replacement who didn’t see the end of the 2nd round. Ajisafe – fighting in his hometown – put the Eastern European out of his misery in the 2nd, delivering him to the canvas on three occasions, the last of which a solid right hook to the soft body, before the referee had seen enough. Great to see Ajisafe on a big hometown show, but this was no sort of contest sadly. Big cruiserweight prospect Isaac Chamberlain, 2-0, returned for his second outing with a convincing points victory over the awkward Jason Jones, 0-5. Chamberlain who looks like he will be more comfortable counter punching had a look at his man early before going through the gears to shake Jones with an impressive uppercut in the final stanza. Chamberlain won out 40-36 on the referee’s card.